Whether you need the flush mount style register or the drop in style register, you send us your material and we will fabricate the perfect vent. So what is the difference between the two styles? 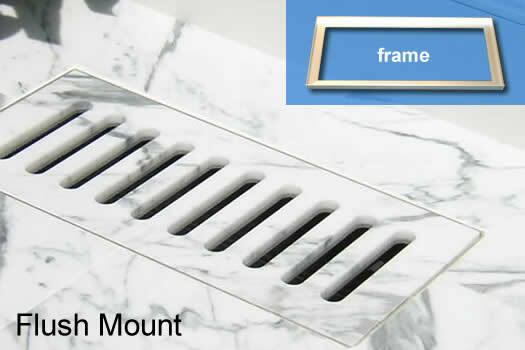 Flush mount - This style creates a smooth, unbroken line of vision across your tile floor. The air vent is perfectly flush with the rest of your beautiful tile. 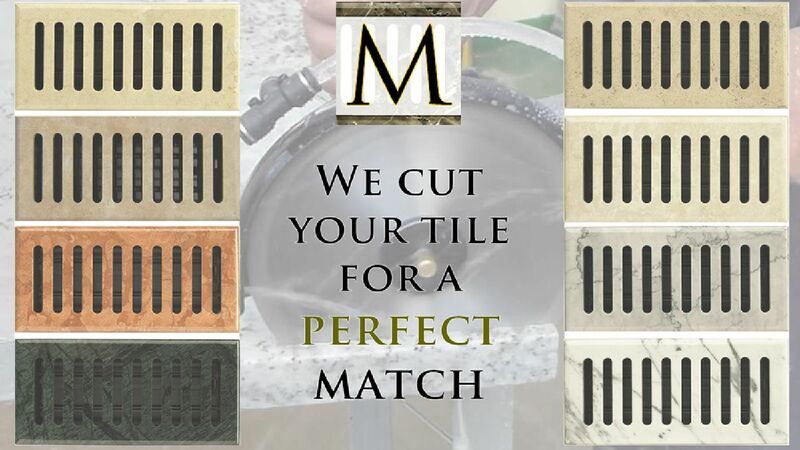 For this process, we ship you an aluminum register frame in your required tile dimensions so your tile installers can accurately set the new tile around the vents. A frame also allows you to easily remove the register for duct cleaning. Drop In - This is the style you often see in metal materials. It simply drops into place and does not use a frame. This is a great option when choosing to replace the vents on an existing floor or in a carpeted room. This version of Flush Mount is made without a damper for applications that don't require control of air flow. Aluminum frame included. 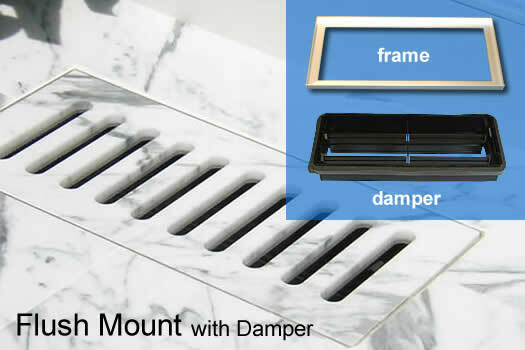 This Flush Mount style comes with the damper to allow you to control your air flow. Aluminum frame included. 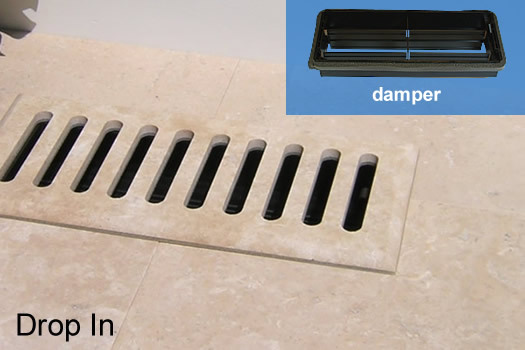 The Drop In style comes with the damper already attached, you simply place the finished register over the vent. We also offer the option to make a partial payment by phone. ready to be shipped - we can do that! You will need to know what size tiles you have and the dimensions of your duct opening(s). Please refer to the FAQs page for specific information. If you are ordering Flush Mount registers, the frames will be shipped first. For proper identification of your order, please include your name and order number with your shipment. If you chose the "Pay by Phone" option: The frame will be charged when shipped and the balance will be charged when the grill (register) is ready to be shipped. Flush Mount style: Place into frame. For best results: Frames should be installed during tile installation. Refer to Install Flush Mount for detailed instructions. See how a flush mount floor register is installed in this video. Finished floor register is then placed into the installed frame.